Does it pay to get a reverse mortgage early in retirement, or is it better to wait until it’s absolutely required – a “last resort”? New research shows early is better. In the most challenging case nearly twice as many homeowners who got a reverse mortgage early still had money at age 92 than those who waited until their investments were gone to use their home equity. The authors said: “Early establishment of the HECM line of credit in the current low interest rate environment is shown to consistently provide higher 30-year survival rates than those shown for the last resort strategies.” The May 2014 study by Pfeiffer, Schaal and Salter was published in the Journal of Financial Planning. It is another article from the team (Salter, Pfeiffer and Evensky) who investigated the “Standby Reverse Mortgage”. Monte Carlo simulations of many lifetimes analyzed investment portfolio withdrawal rates of 4%, 5% or 6% starting at age 62 and running for 30 years. To help improve retirement success a Home Equity Conversion Mortgage (HECM) reverse mortgage line of credit (LOC) was obtained one of two times: either at age 62 or later when the portfolio was completely spent. In either case the LOC was tapped only after exhausting the investment portfolio. The authors designed the study thoughtfully and describe various conditions affecting LOC. The results are measured by the client’s sustainable withdrawal rates and net worth after 10, 20, and 30 years. To develop an intuitive feel for the results the graphs below show the study’s LOCs. The long brown line show the LOC starting at age 62 and three conditions when established late (short green lines). In the study the “late” LOC is in each simulated lifetime is set up at the age when the portfolio runs out – the graphs show age 82 as only one example. The study looks at low, medium and high interest rates in effect when the late LOC is set up. Interest rates and LOC sizes are inversely related: when interest rates are high the homeowner gets a smaller LOC, and conversely a larger LOC when interest rates are low. HECM regulations are designed to balance risks and benefits among borrowers, lenders and the FHA insurance program by adjusting the actuarial chances that the HECM loan value will end up exceeding the value of the home. Once a line of credit is in place, higher interest rates lead to higher loan balances, so those starting balances are reduced. Among the three green “late” lines, the bottom dark green line is for the highest interest rate, so it has the lowest starting point and fastest growth. The tradeoff between starting loan size and the loan’s growth rate leads to the late LOC lines converging after about 10 years. (Note: this discussion blurs the distinction between the two different interest rates used to determine initial loan size and to determine the LOC growth once it is set up). The tan columns show the house appreciating at 3% or 5% a year. The early (brown) line of credit is naturally the same in the two graphs as the home value at the start and grwoth is the same regardless of future home appreciation. The second graph shows the house appreciating faster so the “late” green lines of credit start at higher values, so are closer in value to the early LOC. The top graph’s “later” credit lines start around $200,000 while the bottom graph’s start around $300,000 due to the higher home value at age 82. You can see the advantage of getting the LOC early is smaller when the house appreciates faster. The graphs show the people with the early LOC (the long brown line) had the most reverse mortgage resources later in life to fund spending, and the simulation results confirm that. For example, the “early” people who exhausted their portfolio at age 82 had close to $600,000 in their LOC. Six groups got their LOCs late. 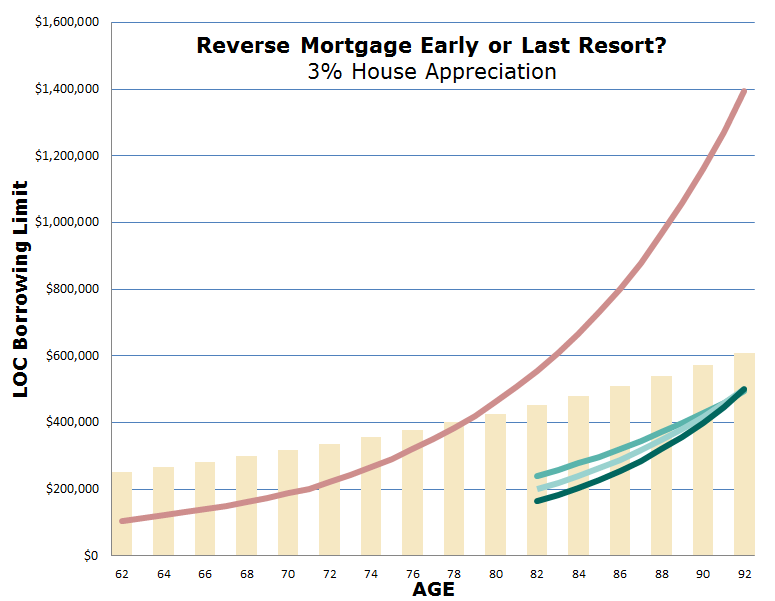 Out of those, the highest green line starting at age 82, and therefore closest to the “early” brown line, were those in the bottom graph where the house appreciated the most, and in the low interest rate environment – the highest start of the three green lines. They got close to $400,000 to help their spending. The worst group to have been in were the people in the top graph where the house appreciated the least, got the LOC late, and found themselves in a high interest rate environment – the bottom darker green line. They got under $200,000 to help their spending. The study did not evaluate other homeowner uses of the LOC, such as unplanned health care expenditures. At the lower 4% and 5% withdrawal rates the early LOC would often have untapped capacity, and would have been completely untouched in a number of lifetimes. A similar observation was median wealth at age 92 did not reflect any untapped line of credit above the home’s value. The authors are to be commended for judiciously conservative assumptions and circumspection in their recommendations. Examples of conservative assumptions were the LOC”s cost included a $35 monthly fee which many lenders don’t charge, using the maximum allowable loan origination fee, and setting closing costs near the top of the expected range. For a much more complete discussion of the study with thoughtful insights please see the original paper! Pfeiffer, Shaun, C. Angus Schaal, and John Salter. 2014. “HECM Reverse Mortgages: Now or Last Resort?” Journal of Financial Planning 27 (5) 44–51.